Dr. Justin Ganjei received his bachelor’s degree in biology from Virginia Tech. He then went on to work at the National Institutes of Health for a short time before returning to Blacksburg, Virginia, where he earned his Doctorate of Veterinary Medicine from the VA-MD Regional College of Veterinary Medicine. 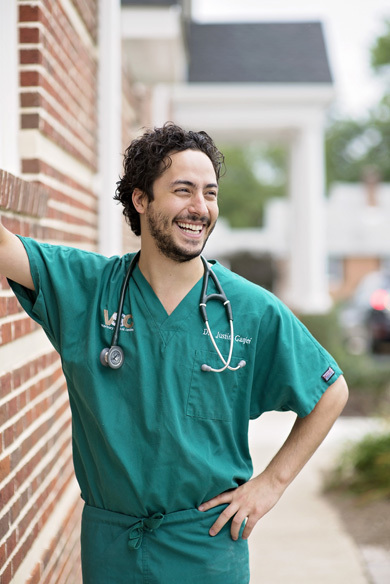 Following veterinary school, he completed a one-year small animal rotating internship at VCA Veterinary Referral Associates in Gaithersburg, Maryland. Dr. Ganjei completed his academic training with a three-year surgical residency at Veterinary Surgical Centers in July 2016. He joined the VSC Surgical Team as of July 27, 2016. He passed the American College of Veterinary Surgeons Certification Examination and became a board-certified Small Animal Surgeon in early 2017.